Hanoi (VNA) – Vietnam and the Netherlands are expected to announce the elevation of bilateral ties to a comprehensive partnership during an official visit to Vietnam on April 9 by Dutch Prime Minister Mark Rutte. 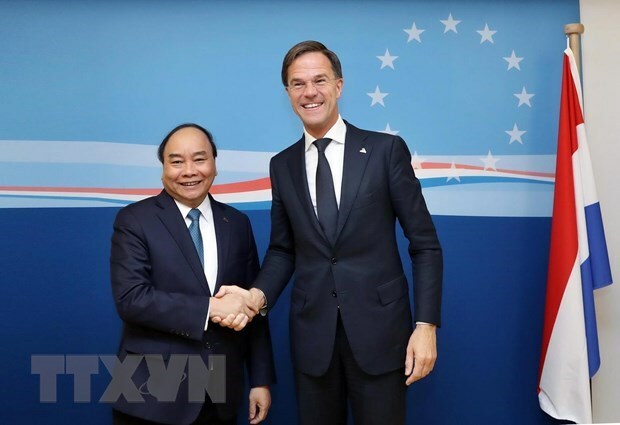 The information was revealed by Vietnamese Ambassador to the Netherlands Ngo Thi Hoa during an interview with the Vietnam News Agency ahead of the trip, which will be PM Rutte’s second visit to the Southeast Asian nation after his first in 2014. She said the visit will be an important event marking a new stride in bilateral relations. It will be an occasion for the two countries’ leaders to discuss measures for enhancing ties in politics-diplomacy and trade-investment and strengthening existing cooperation mechanisms, especially strategic partnerships on climate change adaptation – water management and on sustainable agriculture – food security. The tour also aims to expand ties in high technology, circular economy, transport, aviation, energy and smart city building. As part of this trip, many important events will be held in Hanoi and other localities such as the seventh meeting of the Vietnam-Netherlands Inter-Governmental Committee on Climate Change Adaptation and Water Management; discussions on the water, aviation, agriculture and energy sectors; a business-to-business meeting; and the signing of business deals. Ambassador Hoa said the Vietnam-Netherlands friendship has been developing well. They have maintained regular high-ranking delegation exchanges and meetings. The latest visits to the European nation by Prime Minister Nguyen Xuan Phuc in July 2017 and National Assembly Chairwoman Nguyen Thi Kim Ngan in March 2018 created new momentum for ties. Within multilateral frameworks, the two countries have cooperated and supported each other’s initiatives, especially at the United Nations, the Asia-Europe Meeting (ASEM), and meetings between the Association of Southeast Asian Nations (ASEAN) and the European Union (EU). The Netherlands has also supported Vietnam to enhance relations with the EU and shared the latter’s viewpoint on the settlement of disputes in the East Sea by international law. The diplomat noted the Netherlands has been an important economic partner of Vietnam for years. Bilateral trade doubled from 3.77 billion USD in 2014 to reach some 8 billion USD in 2018, making the Netherlands the biggest market of Vietnamese goods and the second biggest trade partner of Vietnam in the EU. Meanwhile, it ranks first among EU nations and 10th among the countries and territories investing in Vietnam, with more than 300 projects worth 9.328 billion USD. She said both countries face major challenges in terms of climate change, water management and food security, which has prompted them to become key partners in many areas. Many projects under the strategic partnership on climate change adaptation and water management, set up in 2010, have been carried out effectively, especially the Mekong Delta Plan that has suggested recommendations for water management and climate change adaptation issues. Additionally, under the strategic partnership on sustainable agriculture and food security that was established in 2014, the Netherlands has become a big investor in Vietnam’s agriculture, helping the latter promote sustainable agriculture and the value of agricultural exports, Hoa noted. Regarding cooperation in education-training, the countries have also reaped numerous successes, she said, elaborating that they have implemented many cooperation programmes between their universities and in post high school education, granted scholarships and shared specialised knowledge. There are more than 1,000 Vietnamese undergraduates and postgraduates in the Netherlands at present. Besides this, ministries and sectors of the countries have also opened joint training programmes. In terms of locality-to-locality ties, the two sides have established partnerships between Hanoi and Amsterdam, Ho Chi Minh City and Rotterdam, Binh Duong province and Emmen and Eindhoven cities, Vinh Long and Gelderlands provinces, and An Giang province and Oss city.